Experts at their best, focusing their talents and experience on you. Hospital for Special Surgery is America’s leading specialty hospital devoted to orthopedics and rheumatology. Every doctor, surgeon, scientist, nurse, and therapist at HSS is a specialist in caring for orthopedic patients. Collectively, we have treated the most complex cases imaginable. And every day, these experts have just one goal: providing the world’s best medical care for patients like you. Because HSS is a specialty hospital, every aspect of your orthopedic patient experience has been designed to create the best possible orthopedic surgery outcome. Our orthopedic operating rooms are as specialized as the world-famous surgeons who use them. 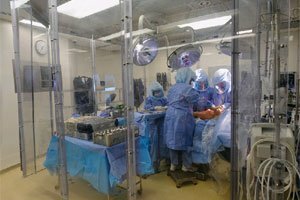 Joint replacement surgeons perform surgeries within special enclosures within the operating room to maintain the strictest sterile environment. A high-tech air filtration system, designed especially for surgery, constantly cleanses and replenishes the air and directs the air flow away from the operation to further reduce infection risk. These important details were specified by the hospital’s surgeons to help them provide the best possible results for every single one of our patients.